On Saturday morning, I was in the mess having Upma and Sheera (Chow-chow bhath as it is called here. Sounds like some kind of dog food, right?!) when I heard Chomu talking of this trip they were planning to go on (the trip was to happen on the same day and it was not yet planned). It was just the opportunity I was looking for. One thing I always wanted to do was to go for trips because I loved travelling and since my college was in such a beautiful part of the Indian map, I could go to all the places in Karnataka that I’d heard so much about. To tell the truth, it was one of the prime reasons why I chose NITK as my college. I had always wanted to live in Karnataka and when I got the opportunity, I grabbed it with both hands. Though I had not heard of Hanumangundi earlier, I thought it would be a decent start. I was my second trip after coming to college, the first being the trip to Gokarna during Incident ’09 (our cultural festival). So, here we go! There were 10 of us. I guess its trip-people-intro time. Paul and Chinky from Mech, Shreyas and Nanda from Trical, C-Sid, Ku, Kalro, Chomu, Suraj and myself from Tronix. A mini ECE trip for us tronix guys. After a not-so-detailed planning session (lasting less than an hour), we decided to hire a car and two bikes. We managed to get a Maruti 800 and two bikes (if you can call them that). It was enough for us, nonetheless. We started off from college (Surathkal) around 10:30 AM, a really late start for a four hour long trip. As I’m a travel freak, I felt it my duty to write down the names of the places we passed on the way. We turned away from NH-17 at Padubidri. We went through Karkala (where we had a dosa brunch at one Sagar Restaurant), Nitte from where we entered a restricted area (Kudremukh) and reached the Falls. There is no distinct “gateway” at the falls, so it is quite easy to miss. We had to descend many steps down to the falls. The sight waiting for us down there was amazing (or rather truly AWESOME).The Falls along with the surrounding forest looked like a scene taken out from James Cameron’s Avatar. The rocks were treacherous and really slippery. 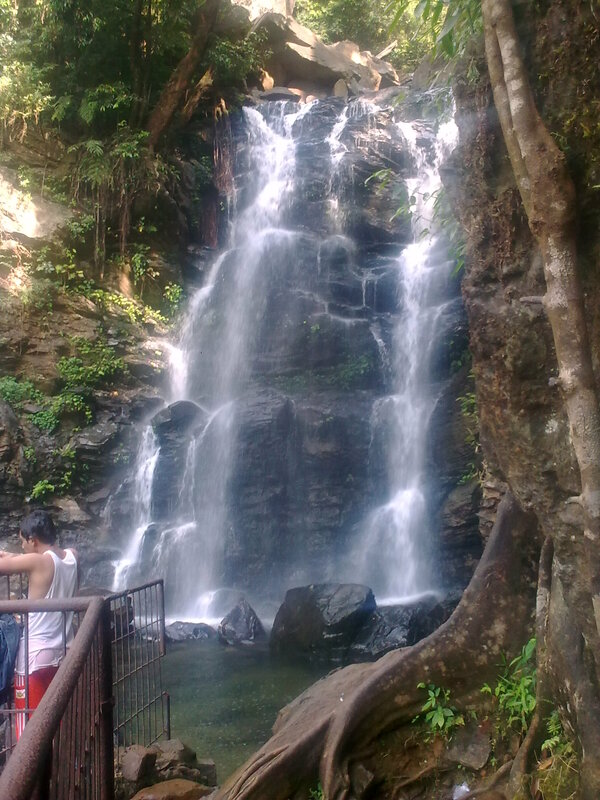 After swimming in the water (the water was clear and ice COLD), we went up to the really thrilling part of the Falls. The trek through the slippery rocks was quite an experience. After all, it is fun to flirt with danger. (You might be wondering what the danger was. I’ll narrate an incident later which will make it clearer). We went to the point directly where the waterfall was ‘falling’. The feel of standing under a waterfall can be explained only by the experience itself. To put it crudely, it is like little rocks falling all over the body with immense pressure without hurting you. Stand right under a waterfall and just take a look at the beauty all around. In this case, the Avatar like scene, as I mentioned before, made it a truly exhilarating experience. We wrapped up soon as we wanted to return before sundown, which, as a matter of fact, was not to be. The ascent back to the entrance was one of the more difficult climbs I’ve had. I guess it was the cold water that did it but we could not climb more than 10 steps at a time. Thanks to the tourism guys, who had thoughtfully placed seats at regular intervals, we could take breaks. We took a different route on the way back, supposedly a short cut. What followed was a gruelling four-hour night drive through ghat roads with Sid on the wheel of a Maruti with one headlight, six eyes on the road (me and Nanda providing the extras), a couple of close shaves with truck head-ons on the curves and almost zero communication with the bikers. Finally we were back in Mangalore at around 8 PM and the ‘back-home’ feeling eased in. After dinner at The Dhaba, we returned to NITK carrying with us an awesome adventure, wonderful memories and a full stomach. Semester no. 4 had started off really well and with great promise.